Ooh Mummy! : Having Absinthe in Belgium. I kinda miss it! Sugar at the Bottom, Absinthe verte. No water added. 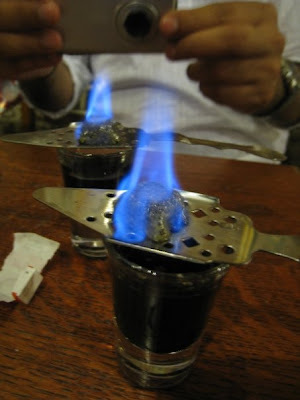 Dousing a sugar cube into my Absinthe noir and then lighting it, ala "Flaming Green Fairy Method". So pretty! The apparatus, if you will. There are even sugar cubes packaged in "Green Fairy" wrapping paper. How cute is that? Traditionally, absinthe is prepared by placing a sugar cube on top of a specially designed slotted spoon and then placing the spoon on the glass which has been filled with a shot of absinthe. 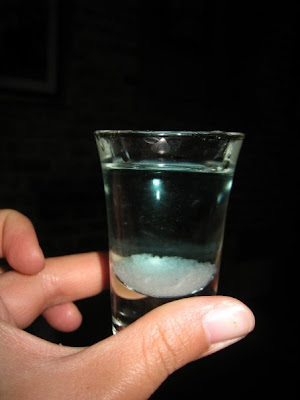 Ice-cold water is then poured or dripped over the sugar cube so that the water is slowly and evenly displaced into the absinthe, typically 1 part absinthe and 3 to 5 parts water. During this process, components not soluble in water (mainly those from anise, fennel, and star anise) come out of solution and cloud the drink. The resulting milky opalescence is called the louche (Fr. "opaque" or "shady", IPA [luʃ]). 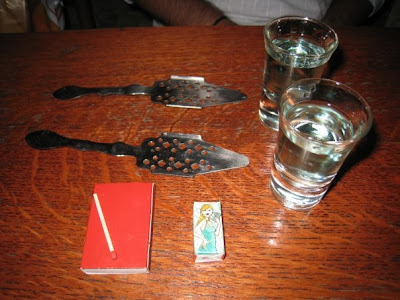 After consuming n shots of absinthe (lost count, but I tried several), I managed to charm the bartender into gifting one of those perforated sugar spoons as a souvenir. I'm usually not that charming so I'll modestly attribute it to the green/black fairy speaking. 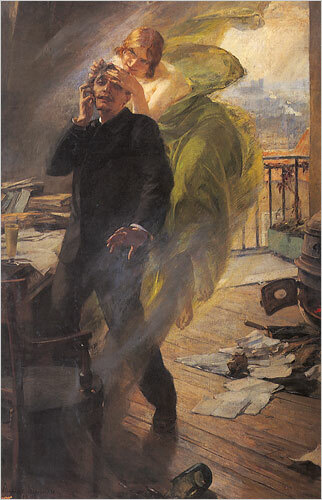 All that... Is not real absinthe. Too bad, sorry. Are you referring to not diluting with water? I think it's pretty without the clear liquid louche-ing into a milky liquid but I wish I got a chance to try other methods!